Forrester finds that 1 in every 10 Web sites is infected with malware. Pearl Software's custom blocking modules keep users from visiting sites that contain harmful content. When Pearl Software scans a site we also download and check for viruses in setup files, zip files and executable files. If viruses are found, the site is added to our Malware category to prevent a seemingly harmless site from launching a drive-by install of malicious code or drivers. Pearl Software allows you to stop malware at its source, before it enters your network and needs to be cleaned up later with anti-spyware or anti-malware programs. Over 15% of new users switched from Websense. Over 20% used to run Surf Control. Ask about our competitive pricing program and find out why it literally pays to switch to Pearl Software. 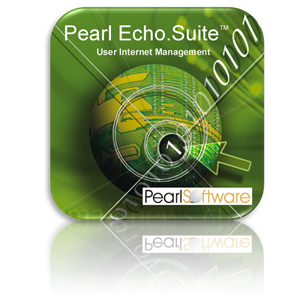 For companies and organizations that need to control policies for user Internet access both on and off their network, we offer Pearl Echo.Suite, a powerful set of cybersecurity applications that are customizable to the specific needs of network administrators. 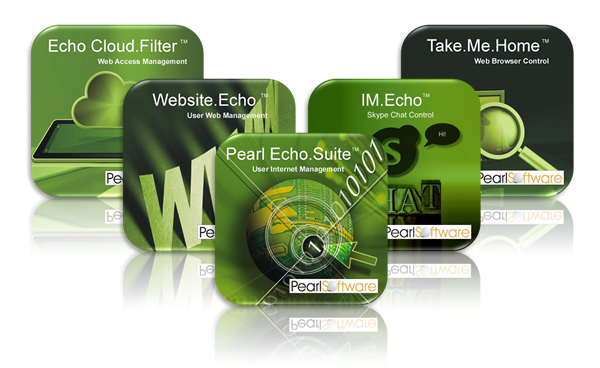 Pearl Echo.Suite is a complete Internet and PC monitoring software package. It monitors everything from e-mail and Skype Chat o end-point web browsing, social media use and file transfers. Accidental as well as intentional data leaks and breaches of confidential information are prevented with customizable controls. Want to determine the amount of online time users are spending? It's easy with Pearl Echo.Suite. Take your management control further with analytics that immediately show you the content that has been written by users in their communications. You'll be able to generate more than 75 reports, all of which can be customized. They can be run as interactive reports, or you can control when they are generated and how they are distributed, according to your specific requirements. When administrators want a full-featured application to comprehensively manage staff Internet usage, they turn to Website.Echo. With this website blocker software, you have the ability to determine website access permissions at group, user and individual computer levels. These permissions can be customized based on blacklists and whitelists, domain categories, time of use and key word triggers. For web sites that administrators trust, they can specify that they not be blocked. With the proliferation of on-the-job instant messaging, employers need a way to manage how employees are using this communications tool. IM.Echo is the answer. It allows you to set permissions at various levels including user, computer and group and restrict usage based on key word triggers, time controls and more. Management can generate reports that cover instant messaging usage and protocol violation. Pearl Software hosts this web-filtering application that gives companies and organizations a policy that comprehensively filters employee web usage without administrators having to install extra software or hardware. With complete network and hot spot control, this solution is easy to configure and hassle-free. This product uses patented technology to redirect idle browsers to whatever website administrators choose. No one will have to spend time resetting browsers that have public access thanks to the automated resetting function in Take.Me.Home.